For anyone who has been a fan of the fantasy world the name of Dungeons & Dragons legendary. It was created back in 1974 by Gary Gygax who like most fantasy lovers, had grown up longing to play in a world like Lord of the Rings. Eventually he was able to simulate that experience with the role-playing game of Dungeons & Dragons where participants would create a character, give them unique attributes and then, using a dice system, throw die to decide the outcomes of different situations. As time passed the game spawned newer and different versions, expanded lore, books, TV series and eventually two movies. The first film, simply titled Dungeons & Dragons, was released in 2000 and wasn't very successful, but there eventually was a sequel called Wrath of the Dragon God which while was released as a TV movie, did show more promise than the original. Now they are released on Blu-ray in a box-set for any die-hard fan. The first film stars Jeremy Irons, Bruce Payne, Justin Whalin, and Marlon Wayans. The story takes place in the land of Ismir, where Mages are revered above all others. There is a ruling council of mages that weighs in on the day to day lives of the commoners. One of these mages, Profion, played by Irons, wishes to rule over the land and hopes to do so by gaining control over the dragons of the land. The only real problem in his way is the Empress, played by Thora Birch, she possess a scepter that controls golden dragons and while she does Profion has no hope of ever wrestling control from her. That is until he learns of a scroll that when deciphered will lead to another scepter that controls red dragons. Naturally Profion wants this scepter for himself, so he sends his number one enforcer, Damodar, played by Bruce Payne, to find it. As this is happening we are introduced to our two heroes, Ridley and Snails, played by Whalin and Wayans. They are thieves who take it upon themselves to raid the mages tower for whatever they can find. As they are doing so, a young mage by the name of Marina is in the midst of deciphering the very scroll Profion wants for himself. Marina catches the two young thieves in the act of stealing but is distracted by the appearance of Damodar who wants the scroll for his master. In the midst of battle Marina, Ridley, and Snails escape with the scroll and head off together to try and beat the forces of Profion from obtaining the scepter. Along the way they gain a new ally; Norda, who is an elf tracker working for the Empress. Eventually they obtain the scepter only to have it stolen by Damodar. There is a final battle culminating in the defeat of not on Profion but Damodar as well. To say this movie is cheesy would be an understatement; the acting is extremely over the top, the special effects look as though they were done in someone's basement, and the sets themselves look like they may fall over at any moment. But while there are these faults within the film there are core elements from the original game that remain within the movie itself. We have the dragons which are a staple of most D&D games; we have the representation of the guild system like the mages and thieves guilds but most importantly are the character classes. The most obvious are human, elf and dwarf; similarly we have the fighter, thief, mage and ranger. . Because it got the Blu-ray treatment the picture and sound quality really hold their own against more heavy weight movies of our time. We also get treated to some extras, like commentaries, making of documentaries, a look at the game of D&D and an interview with Gary Gygax himself. While a lot of the fundamentals of the D&D do get washed over by the inane plot, the core of the classic game is here; which for any fan willing to look would be a bright spot in an otherwise tough film to watch. Download Dungeons & Dragons from the iTunes Store in Digial HD. 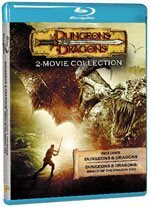 For more information about Dungeons & Dragons visit the FlickDirect Movie Database.